Gaining leadership skills is vital in career and life development. When I signed up as an SAP Volunteer Ambassador for the October 12 CityTeam event under the encouragement of SAP CSR Associate Helena Lacroix, I knew this was a precious opportunity for me to learn leadership skills. After successfully having 19 volunteers at the CityTeam event, I gained a great sense of accomplishment while feeling good about how the volunteers and I are making a difference for local communities. I learned valuable leadership lessons such as how to recruit volunteers through my own personal network, how to communicate effectively with volunteers, and how to work with others and bond as a team. Lester and Pauline Meyers started CityTeam in 1957, to serve the homeless population in San Jose, California. CityTeam’s mission is to serve people living in extreme poverty and transform their lives. 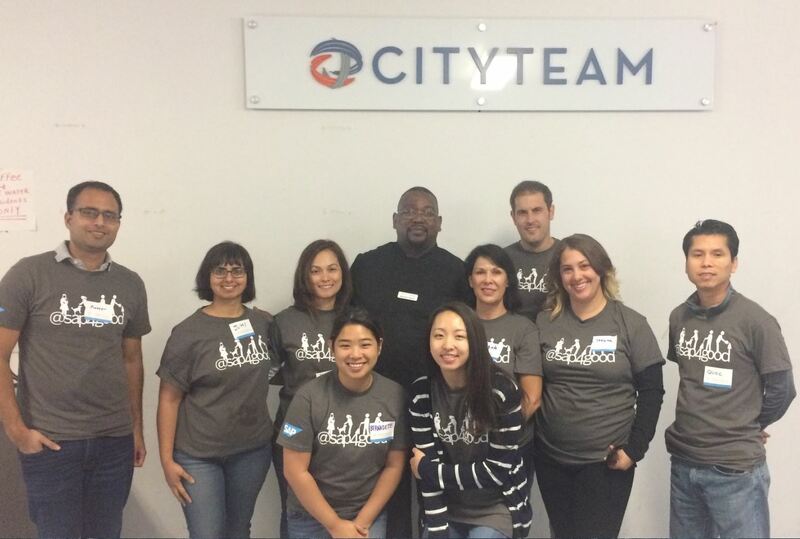 Thanks to volunteers and donors, CityTeam in the United States is impacting the lives of over 500,000 people each year, through vital programs including homeless shelters, food boxes, family services, recovery programs, and Heritage Home providing long-term compassionate care for the homeless. Almost everyone arrived at CityTeam’s office lobby between 8:40 a.m. and 9:05 a.m. to check in with the CityTeam system. I gave a brief introduction to the volunteers, and let Erin (CityTeam) and Gannon (HOBA, for Hands-On Bay Area) explain what the volunteers would be doing that day. After Erin and Gannon finished, they divided my volunteers and me into 2 teams: the kitchen service team and food packing team. I chose to join the food packing team. My team of 8 volunteers arrived at the food packing area, and a CityTeam staff named Oscar taught us on how to pack canned and dried foods into bags and boxes. 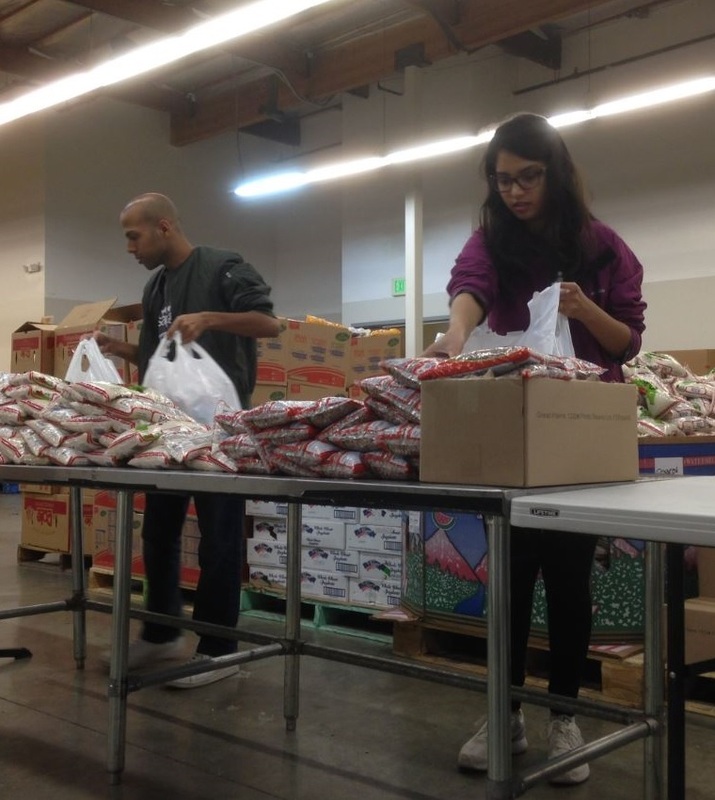 He explained that at later times, these food boxes will be delivered to families in need. For the next 2 hours, my team and I worked non-stop to pack food into bags and boxes while having fun and good conversation! Meanwhile, 8 kitchen team volunteers began food preparations at the CityTeam’s community kitchen. 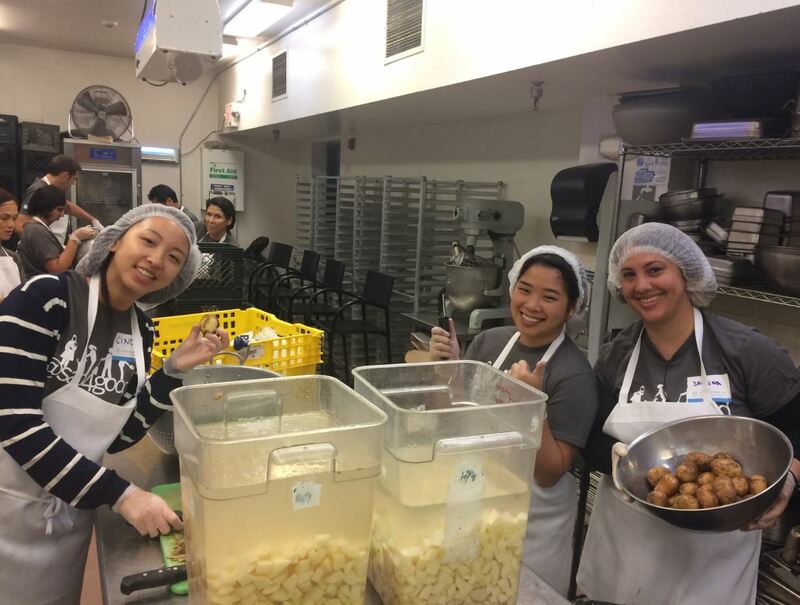 For 2 hours, volunteers diced potatoes and vegetables into small cubes to be used by the cooks to cook up stir-fry dinner meals for homeless guests later that evening. When I visited their station, the volunteers were having a great time dicing potatoes and vegetables, talking to each other about their life and work! Indeed, volunteering can bring people together! Thanks to the hard work of 8 SAP volunteers (including me) and Gannon at the food packing, we successfully packed 233 bags of food, equivalent to 5825 LB of food that can feed 1165 people for 2-3 weeks! 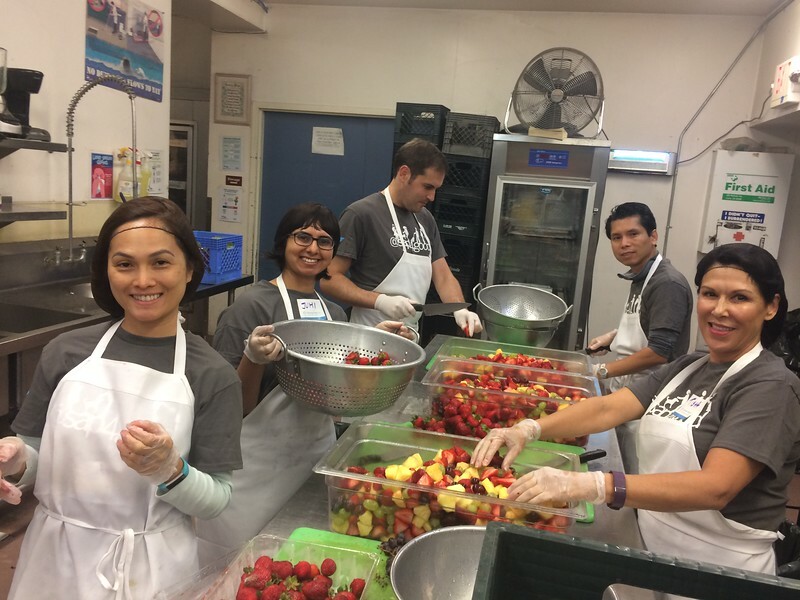 Thanks to the hard work of 8 SAP volunteers at the kitchen duty, the potatoes/vegetables they diced could help CityTeam’s cook prepare up to 600 dinner meals for the homeless! I felt good about giving back to my community! When I learned from the CityTeam staff that many poor families and homeless people will be helped because of me and my volunteer’s actions on October 12, this brought me great joy and happiness. 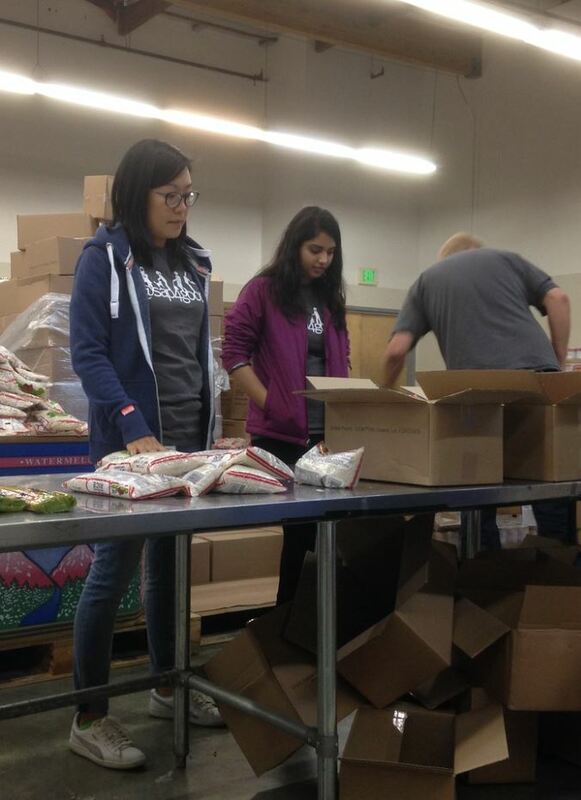 The event adds great meaning to my life as well as the life of 18 other SAP volunteers. By working with a diverse set of 18 colleagues outside the SAP office, I am happy to have had a chance to do something meaningful with them so I can bond with them personally, and volunteering outside the office greatly reduced stress from my work in SAP! 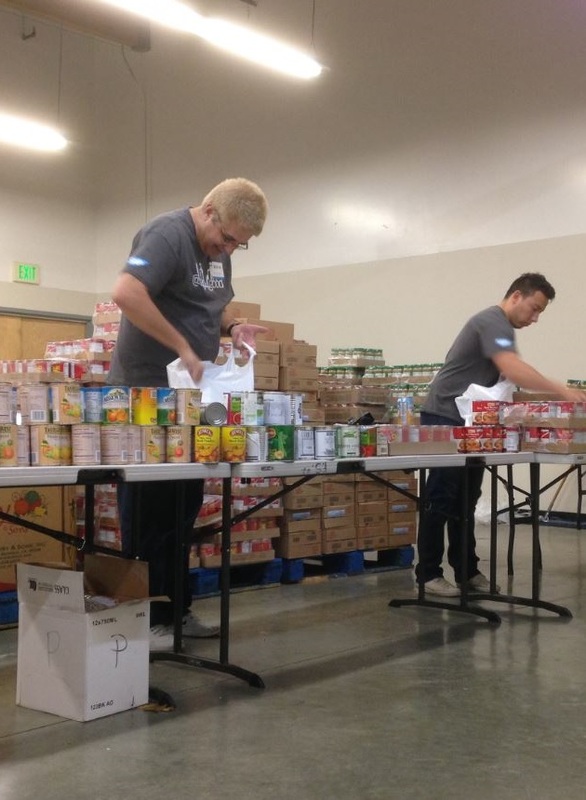 Taking the time to volunteer is healthy for all employees of SAP, and that is why I encourage every employee to volunteer during Month of Service! 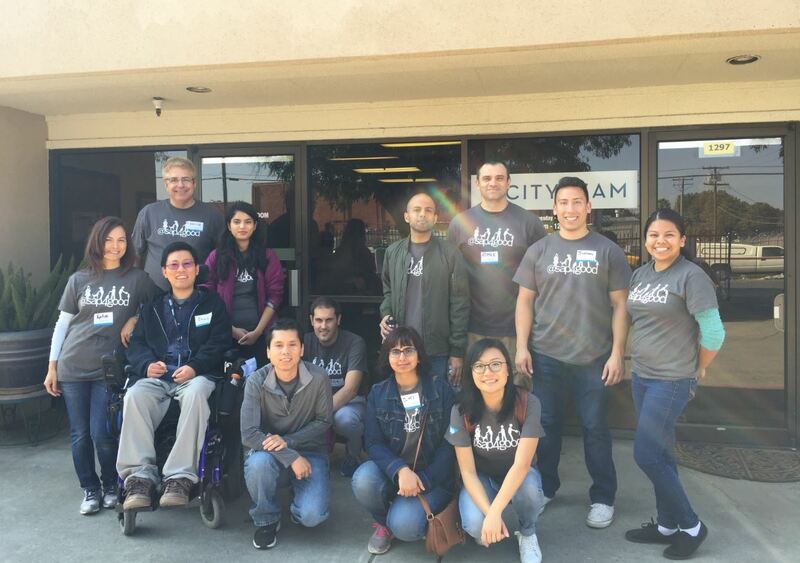 I really want to thank the 19 volunteers (including me) for their hard work – they are the ones making the October 12 CityTeam event a great success. I also want to thank people in SAP CSR (Corporate Social Responsibility), HOBA (Hands-on Bay Area), and CityTeam for their guidance and support. To experience the magic of making a difference for your community and learning leadership skills, I highly recommend any SAP employee to become a SAP Volunteer Ambassador and lead any future volunteering events! To see more details regarding the event, please visit https://sap.benevity.org/node/1875. If you see it ask you to sign in, just click on the button to sign in. Hope this helps? Are you an SAP employee?